Слава Ісусу Христу! Слава на віки! Glory to Jesus Christ! Glory Forever! We are a council composed of Ukrainian gentlemen from the Hamilton and area district. We support the Ukrainian Catholic Churches in the surrounding area and also the Sisters at Mount Mary Immaculate in Ancaster. Our Worthy Grand Knight is Brother Don Krochak. The Knights of Columbus emblem symbolizes the Order's worldwide commitment to Charity, Unity, Fraternity and Patriotism. Living according to the principles of charity, unity, fraternity and patriotism, Knights work in local parishes and internationally to make the world a better place each day. We welcome all Catholic Gentlemen interested in joining our fraternity to proceed to the "Contact" page listed above and filling in the comment section with your name and either phone number or email address. One of our Membership Committee will respond to your request with more information. 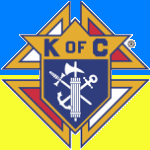 Note: Membership in the Knights of Columbus is open to men 18 years of age or older who are practical (that is, practicing) Catholics in union with the Holy See. This means that an applicant or member accepts the teaching authority of the Catholic Church on matters of faith and morals, aspires to live in accord with the precepts of the Catholic Church, and is in good standing in the Catholic Church. Tryzub (Ukrainian Trident) The Tryzub (pronounced “treh-zoob”) is the ubiquitous symbol of Ukraine. The ancient symbol is believed to have originated as a tribal symbol; today it is emblazoned on the country’s flag, on postage, money, business logos, even Easter eggs! The highly stylized version seen almost everywhere in Ukraine originated as the family crest of Volodymyr, a tenth century Ukrainian Prince. Today, the tryzub is worn as a symbol of national pride, as a symbol of the Christian trinity, or as a synthesis of the divine elements of fire and water in the manifest world. ©2018 Knights of Columbus Fr M Shashkevych Council 7464. All Rights Reserved.